Thank you to Phil Cucuru for the Good Harbor Beach information and news of restoration plans to begin soon, after the public school’s April vacation. During the week when the school children are off premises, the DPW turns its attention to the school buildings and grounds. As soon as vacation is over the DPW will be resume work at Good Harbor Beach and all the Gloucester Beaches. We lost about three to four feet –in depth– from Good Harbor Beach (Wingaersheek, as well). As you can see in the above photo, Phil is pointing to where the sand came up to the #3 sign prior to the March storms. This is why the tide is coming in so high and so close to the bluffs, and why the big rock has become even more exposed. 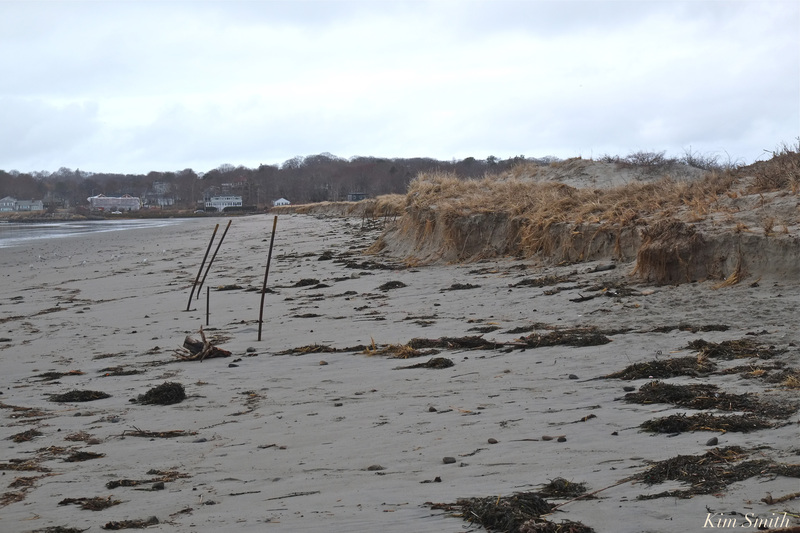 Up until the March storms, the metal fence posts were nearly completely buried beneath sand that had built up, with only about 3 inches protruding above the sand. Now they are completely exposed, with a sheer bluff, rather than a gently sloping dune. 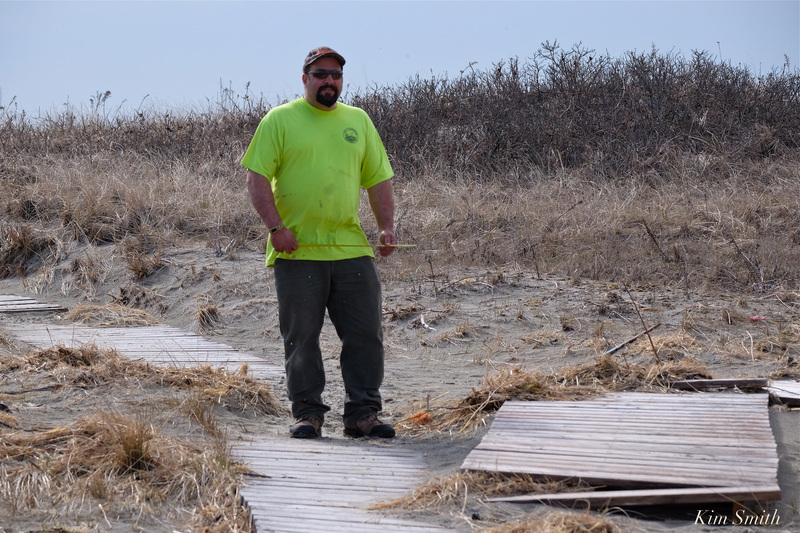 Plans have been in place since last year to restore the dune fencing this coming summer! I was so happy to hear this update about the dunes from Phil because the fencing helps to create areas of vegetation on the beach, at the base of the bluffs, and fencing helps to keep people and pets out of the dunes and from trampling the fragile habitat, especially the wildflowers and beach grass so necessary for a strong, healthy, and vital dune ecosystem. 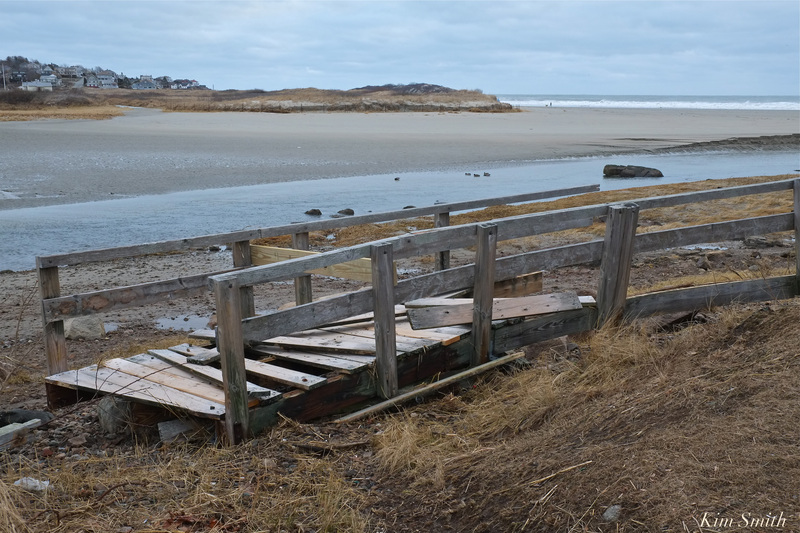 All three boardwalk accesses to the beach were severely damaged. 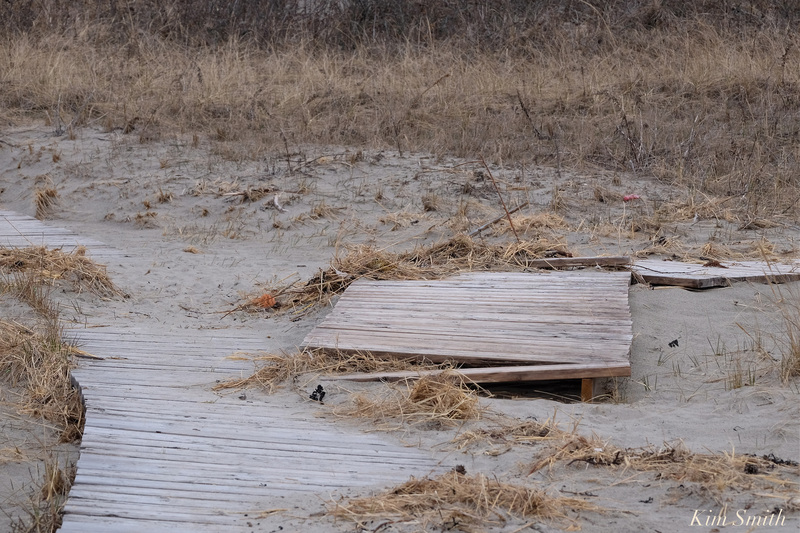 Believe it or not, the storm surge was so strong, it broke away huge sections of the boardwalks, and pushed them twenty and thirty feet back into the dunes. Boardwalk number two is nearly destroyed, which is especially frustrating because the DPW completely redid boardwalk #2, and made wider for handicap accessibility, last spring. The surging ocean water poured all kinds of debris into the dunes as well, and widened the walkways onto the beach. 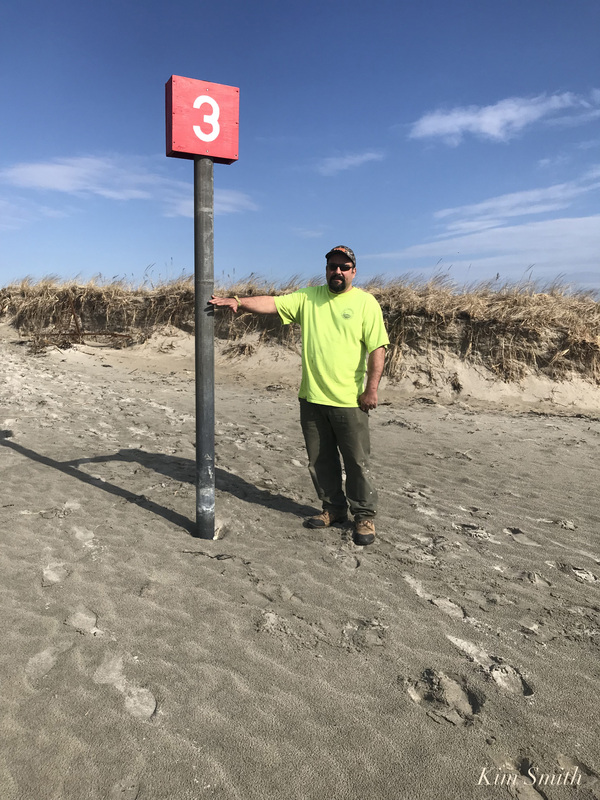 Phil said that in twenty years of working for the DPW he has never seen the likes of the March nor’easters and, with that, such extensive damage to Gloucester beaches. Phil measuring for repairs. Good Harbor Beach footbridge torn from its footings and in the marsh. The day before the first nor’easter Phil and fellow crew members added steel braces to help shore up the bridge but unfortunately, nothing was safe from the power of the late winter storms. Plans too are being developed to repair the footbridge, with the goal of full restoration by Memorial Day weekend. Thanks again to Phil Cucuru for the updates, so glad to hear the good news! This entry was posted in Birds, Birds of New England, Good Harbor Beach, Life at the Edge of the Sea, Piping Plover and tagged Beautiful Birds of Cape Ann, dune fencing, Gloucester DPW, Good Harbor Beach dunes, Good Harbor Beach restoration, March Nor’Easter, PHIL CUCURU, storm damage Good Harbor Beach, storm damage Good Harbor Beach footbridge, Storm Surge on April 16, 2018 by Kim Smith.